a little oil or butter for sautéing. 1. 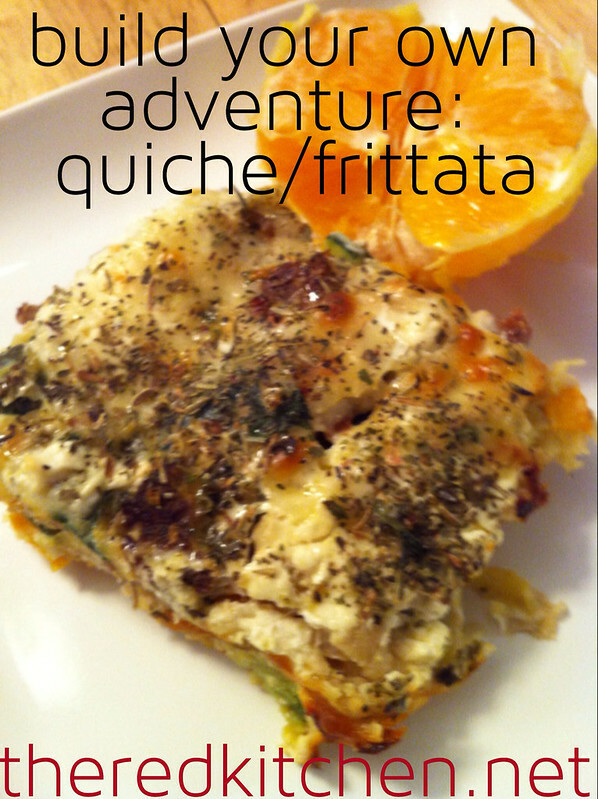 Prep your pan: For a quiche, I use a frozen crust, places in a glass pan and placed in a 350° oven for 5-10 minutes to defrost and toast up a little. For a frittata, spray a glass pan with some oil. other great options include leeks, broccoli, onion, jalapeño, riced cauliflower, cooked green bean pieces, cooked spaghetti squash, etc! 3. Prep your meat: lightly defrost frozen pre-cooked ground meat, vegetarian meat, or sausage links. Cut sausage links into small circles if using. Add cold meat to your veggies to warm through. Or if you have cooked meat like chopped chicken breast, no further prepping is needed, just add to your veggies. 4. Finish adding veggies and herbs: spinach or kale is a great item to add to egg dishes - you can choose to use a frozen box of spinach (defrosted and drained) or a small bag of fresh spinach/kale, chopped roughly. Add this to your pan with the other veggies and meat. Slice up any fresh herbs you wish to add - see list below for ideas. Season to taste with salt and pepper. 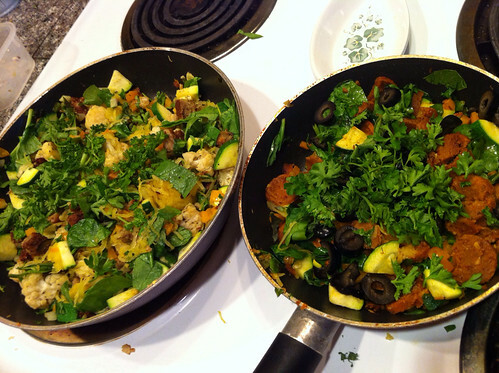 Gently place this veggie+meat+herbs mixture into the prepared pan. 5. Cheese it up: gently sprinkle cheese on top of the veggies in the pan. 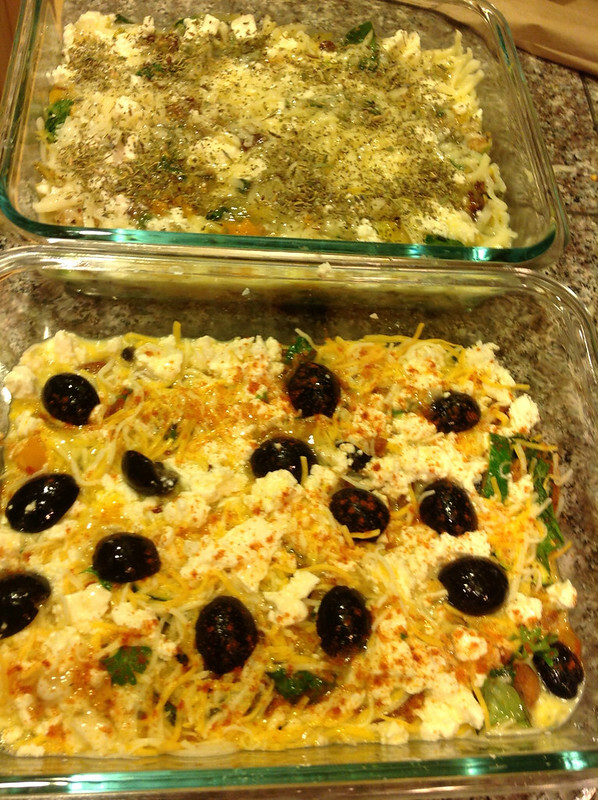 I use a combo of a "normal" shredded cheese blend like 1 cup of cheddar or a Mexican blend, and then top that off with a small amount of a flavorful cheese like 2 ounces of sharp provolone or 1/2 cup crumbles feta. You could replace some of this with a lower fat option like Laughing Cow or a 2% version of your favorite cheese. 6. Mix up the eggs and milk: in a separate bowl, combine eggs and milk and wisk well. How many? I've found that my pan fits 3 eggs and 1 cup of milk. You can do any combo of eggs to egg whites, just plan that about 2 egg whites are the same quantity as a single egg. I use almond or soy milk for this recipe, but whatever milk you have on hand should work fine. 7. Put it all together: slowly pour the liquid mixture over the pan. By doing this slowly, it will let the liquids flow over the other ingredients, getting into the nooks and crannies rather than overflowing or staying on the top! Place in a preheated oven at about 375° for 30 minutes. To check for doneness, stick a knife in the center of the dish and see if the liquid is set. When you take the pan(s) out of the oven, let them set for 5 minutes to give it a chance to set while it cools a bit. 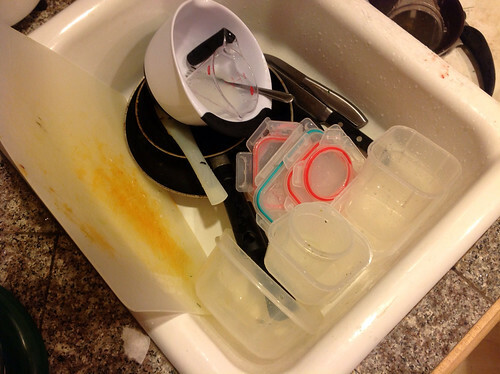 Tip: if you did the refrigerator velcro idea to the fullest, your sink may be filled with leftover storage containers! This is good!